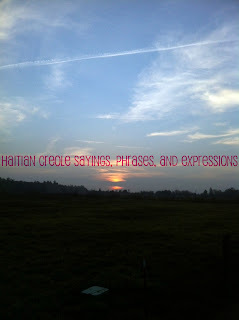 "Very Popular Haitian Creole Sayings, Phrases, and Expressions" helps you learn Haitian Creole and culture in no time. It provides you with the popular expressions, phrases, and sayings. You will be able to use them in context. The examples you will find in this ebook will encourage you to generate additional sentences. "Very Popular Haitian Creole Sayings, Phrases, and Expressions" is a must-read ebook for everybody who has dreamed about understanding the double meaning of haitian talk hidden in the sayings. It comes equipped with the explanations of the most frequent proverbs. 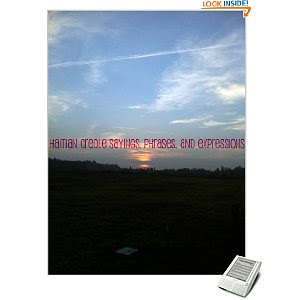 Purchase a copy of "Very Popular Haitian Creole Phrases, Sayings, and Expressions" for $2.99 from Amazon Kindle now. Purchase a copy of "Very Popular Haitian Creole Phrases, Sayings, and Expressions from Barnes and Noble as a Nook eBook. Ki Jan Nou Di / How do you say ‘I Miss You, Happy Birthday, Happy New Year, and Merry Christmas’ in Haitian Creole? How do you say ‘flirt’ in Haitian Creole…? **Why are you flirting with me like that? You are married! **Poukisa wap file-m konsa? Ou gen madanm! Ki jan nou di ‘Bòn Ane epi Jwaye Nwèl’ an Kreyòl? *** Ti nèg sa-a anmèdan anpil – Li toujou ap chache-m kont – This young man is a bully. He always looks forward to picking a fight with me. Purchase a copy of this ebook from the above sites to find additional expressions, sayings, and phrases.